most of a touristy nature with no toys present. 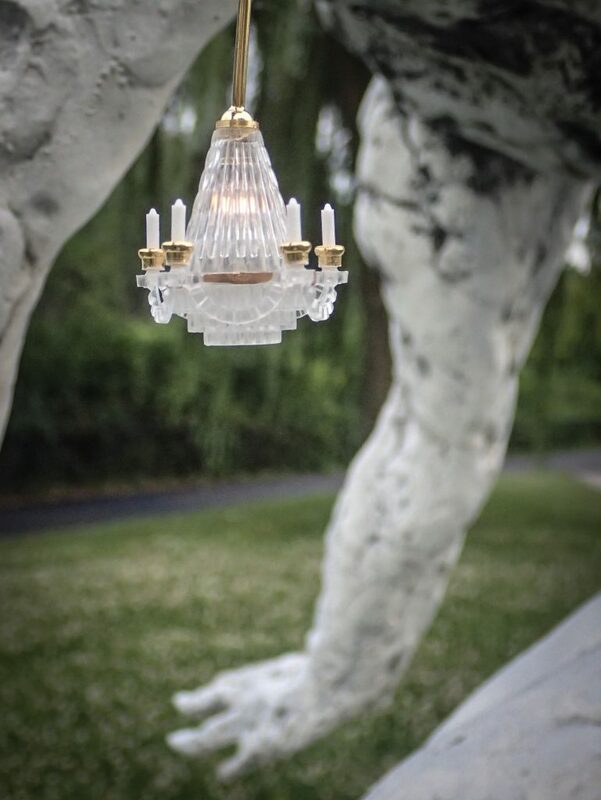 But, one night I did find myself at a sculpture park, with the perfect opportunity to put to use my 2″ tall plastic, electric dollhouse chandelier that I brought with me. 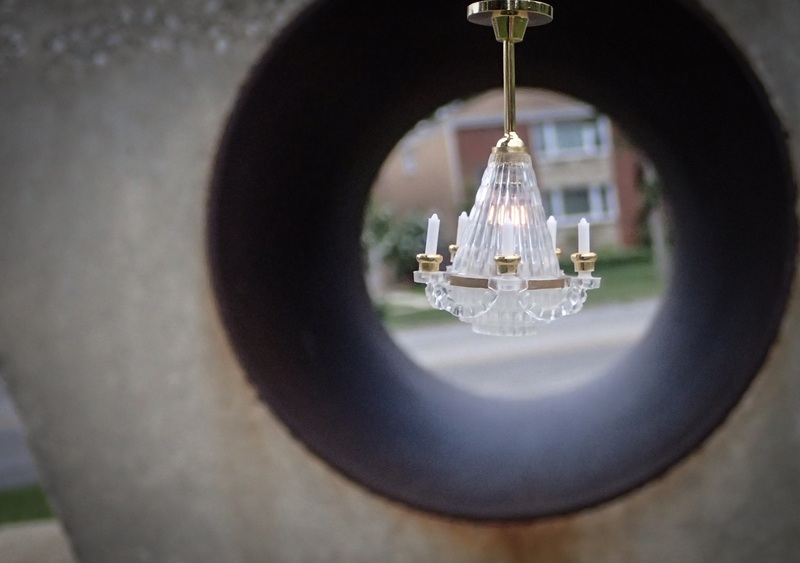 I purchased the chandelier with the idea of creating outdoor rooms, of playing with the juxtaposition of inside v. outside space and therefore a looking out on new opportunities, new starts, open windows and doors. The sculpture park with all its various structures of sorts allowed for a backdrop to the chandelier. In order to get the electronic component of the light to work, I wired it to a battery pack and was well on my way. For these I decided to shoot with my Olympus TG-4 – a point and shoot camera, but with great macro and other versatile capabilities. While I had brought my DSLR in my suitcase, this quick, on the go walking trip, with chandelier held in one hand, seemed to call for a lighter camera. As for toys, I had also had brought along a couple guys in hazmat suits, and a few tiny photographers – none of them actually made it in front of my camera. 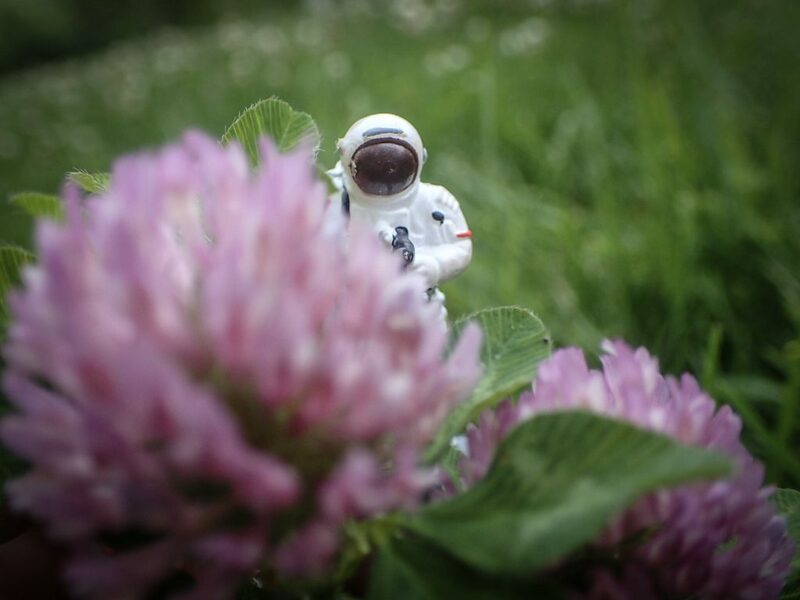 But I did take a couple shots, also at the sculpture park, of a little astronaut – another symbol of new beginnings. I’m pretty happy with the results. For one, considering my exploration for toy photography was pretty limited when posed around daylight hours and work responsibilities, and for two, because I feel like I actually accomplished the symbolism I set out to capture. While the past few weeks have been exhausting, there’s something to be said about the inspiration that can be found by changing your surroundings and stepping outside the genre. As a slight departure to the above, while in Chicago, I also got the opportunity to see the Thorne Miniature Rooms at the Art Institute. 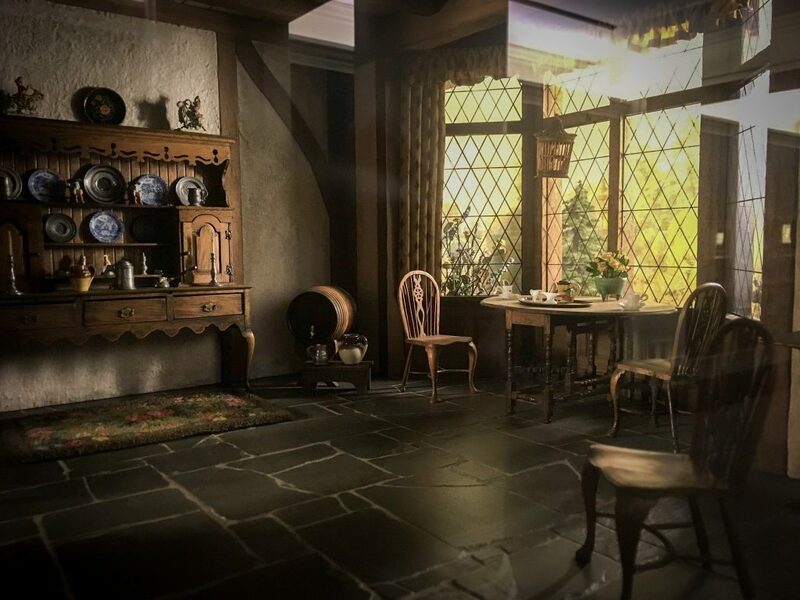 They are stunning, intricate, 1:12 dollhouse scale, historic dioramas and while they are 3-D, the lighting in which they’re posed is amazing and could be hugely influential in this small scale photo world we find ourselves in. Here’s one for example. I took way too many photos of these rooms, and sometimes love the idea finding the best way to photograph pre-setup mini spaces. All of them were behind pretty reflective glass, without a polarizing filter on hand, and taking these images with my phone, I had to get creative when it came to making the odd reflections work within the image. Have you created photos in a new location recently? Literally all I care about is photographing toys...and writing about photographing toys. Next PostWho is your audience? 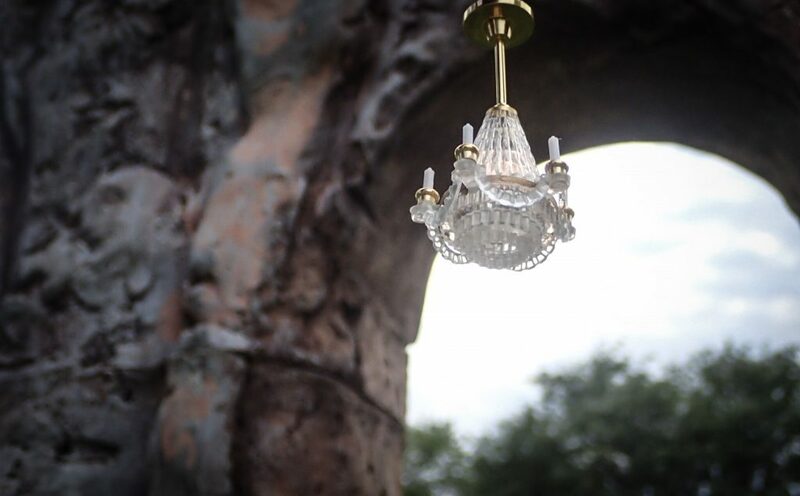 Jennifer I really enjoyed your images of the chandelier in the sculpture garden. I thought the idea behind it was a good one. I hope you will consider taking this chandelier with you whenever you venture out. It would be interesting to see how this series evolves over years and your many future adventures! Thank you so much. When I traveled to Italy in 2012 I bought the mini architecture models for 1 – 2 euros from the street vendors and photographed them with their full scale objects. I since did the same with the fort in St. Augustine. And was hoping to with Cloud Gate in Chicago – although I didn’t have time to hunt down a mini version. The chandelier is sort of an extension of the big stuff little stuff theme that is more easily adaptable, so I certainly hope to continue the series elsewhere. I so adored the rooms. I could have spent hours with them. Perfection is far from what I go for in my own photographic sets, but I like to imagine the artisans of the Thorne rooms and how intensely focused they must have been on these time consuming projects. Thank you so much. I’m definitely still working out the kinks, but I’m pretty happy with this go round. It will be interesting to see how my thought process changes next time.